When the first 1962 Ford Mustang I Concept was completed, it really shared more features with the Ford GT supercar than any Mustang ever built. 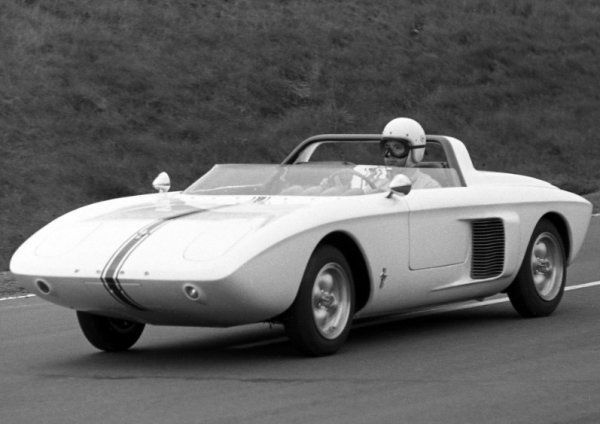 The Mustang I Concept was a small 2-seater sports car comprised of ultra light materials and utilizing a mid engine architecture that made the little roadster a supreme vehicle in terms of handling. Also, due to the lightweight construction 9it weighed around 1,500lbs), the Mustang I Concept derived its power from a V4 engine measuring just 92 cubic inches and sending 109 horsepower to the rear wheels via a 4-speed manual transmission. When this car made its formal debut at the United States Grand Prix at Watkins Glen, famous racer Dan Gurney was able to turn in lap times almost as fast as the F1 race cars of that era. Also, this car was able to climb to speeds over 120 miles per hour on the highbanks of Daytona Motor Speedway. Unfortunately, there was only ever one running version of the 1962 Ford Mustang I Concept built and as the development of the 1964.5 Ford Mustang production model evolved over the years following the introduction of the first Mustang-badged concept – the design quickly went a vastly different direction. In the end, the 1964 Mustang was nothing like the original Mustang I Concept but the video below – which has recently been re-released by Ford Motor Company – shows the steps taken to design the car that would eventually lead to America’s longest running car nameplate. Even though the Ford Mustang I Concept shown in action in the video below never came close to reaching production, it was that sleek little roadster that was first connected with the name Mustang due to its design similarities to the P-51 Mustang fighter jets of that time period. This Mustang Concept was also the first to wear the “running pony” logo that has adorned the mustang since being introduced in April 1964. This classic video walks us through the design and planning that went into the Ford Mustang I Concept, explaining the unique concept car from the engineering around the welded tube space frame chassis to why they went with a mid engine design to why they chose the tiny V4 engine. We also get a look at the clay model design, the production of the fiberglass body and wind tunnel testing to check the body of the Mustang I for proper aerodynamic properties and the assembly of the car itself which was all performed by hand including every body panel. As you watch this video, pay close attention to the design and engineering aspects of the original Ford Mustang and consider how many of those aspects have become the norm for the modern supercar segment. When you look at how many aspects of the original Mustang have become commonplace in the supercar segment, it is clear that the 1962 Mustang I Concept didn’t reach production because it wasn’t good enough – it didn’t make it to production in that form because it was some 30 years ahead of its time. The seats were fixed parts of the body with pedals and a steering wheel that adjusted rather than moving the seat, just like some modern supercars. The Mustang I Concept also wore a coil over shock suspension setup, had an integrated roll bar, sported magnesium wheels and used side mounted vents to cool the engine – in addition to the space frame and the mid engine design. I should remind everyone who sits down to watch the promotional firm for the 1962 Ford Mustang I Concept that this video was made some 50 years ago and it looks like something that your 8th grade science teacher would have you watch about the reproductive cycle of the bullfrog – right down to the voice and some random “skips” in the sound. Even with the imperfections in the video, this clip was the first look at the program that would eventually lead to the Ford Mustang that has become one of the most popular cars in the history of the American automotive industry. The Ford Mustang I Concept is about 24 minutes long so grab a cold drink and a snack, sit back and enjoy this video showing the car that would lead to the mighty Ford Mustang.